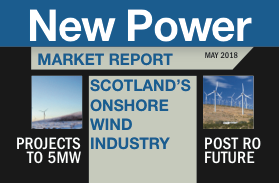 New Power’s March issue explored whether the UK onshore wind industry could punch above its weight in a growing global market. The key was a pipeline of domestic projects. Giving evidence to the Lords Economic Affairs Committee in February, energy minister Claire Perry MP said the UK had a “triple test” for providing R&D funding for any form of decarbonising technology: “Can we deliver a cost-effective pathway for consumers, can we decarbonise, and can we create some competitive advantages we can export?” She added: “Some really big opportunities spill out from the energy strategy into the industrial strategy and beyond.” She highlighted smart meters and smart grids, noting that the government had recently signed a deal with South Korea to provide expertise in that sector. But what happens when the industry has gone past the development stage? Can the UK retain a “competitive advantage” when the first rollout has been completed and the UK domestic industry no longer has political will behind it? This is where the UK’s onshore wind industry now finds itself. The government continues to have broad support for renewables, but in the case of onshore wind that support is highly qualified – three years ago, Amber Rudd, then secretary of state, said “we have enough wind farms”. That’s not the view of some industry-members. Speaking at the Future of Utilities summit, SSE chief executive Alistair Phillips-Davies said there remain good sites across the UK with excellent wind availability – and he said that existing sites would have to be repowered. Michael Lewis, chief executive of E.On UK, noted that the UK was taking the cheapest form of generation out of the merit order, despite a concern over energy bills that had resulted in plans to cap prices. The UK invested in the engineering and financial industries that have underpinned its onshore wind rollout and it succeeded in developing an important industry – even in the 1990s when UK build was slow. Now onshore wind is a major global business. At a time when Brexit means the UK has to expand its offering to global markets, can we leverage our wind industry skills into a global brand? With the help of market research company Accent, New Power asked a group of industry representatives whether the UK could retain its industry. One respondent pointed out that even without expanding the number of wind farm sites there could be a different sort of project pipeline in the UK, because “repowering with more efficient turbines will be increasingly significant”. “The UK is good at implementing onshore wind even if we are not competitive as a manufacturer of turbines,” said one person in response to our survey. If the UK cannot compete on manufacturing terms – especially for projects outside the UK – where is the UK’s specialism? Our respondents chose several areas of expertise where the UK has high-value skills. The most important were in planning and design, and in the skills needed when wind farms are operating: monitoring, management and optimisation. These were seen as important areas of technical expertise and an opportunity for UK plc. A second important set of opportunities arose in the financial and professional services required to finance and structure a project. Banking and structuring deals, and providing insurance and professional services, were all considered opportunities. When New Power/Accent asked whether and how government and industry could leverage these skills for a global industry, the respondents were positive. “UK planning consent is fairly unique but many principles can be applied globally. Mostly we will export expertise,” said one. Others saw a bigger role for government. One said there was “an important role for the government to lead and organise a coherent and sustained response to opportunities overseas”. Another agreed it should be active, putting together a “package of development skills and finance” that would enable exports. Another wanted a more fundamental approach, to “organise UK plc research and development to offer a cost advantage for UK design”. But for several respondents, the opportunity was restricted by the UK’s lukewarm approach at home. “The lack of a domestic market makes it harder for UK-based firms to maintain critical mass,” said one, while another said the government had to “allow the sector to thrive at home as a showcase and support the industry, providing services such as finance and consultancy in emerging markets such as Latin America”. The opportunity was clearly large. Target markets should be countries “that are either developing fast and therefore have an increased demand in electricity, or those that need to decarbonise”, and certainly “all countries with GHG targets that they intend to meet”. One respondent was both more overarching and more precise. “Where the wind blows and where there is a large land mass… where there is an absence of fossil fuel reserves,” they said, naming China along with France, Italy and Spain as good candidates. A Brexit gap or a global role? After the UK leaves the EU, will the UK have to act to strengthen its wind power offering or fill gaps, such as in lost skills or research funding? Others thought differently but had varying levels of concern. “There may be some impacts on research funding, depending on whether the UK negotiates a ‘buy-in’ to EU research programmes,” said one. “Similarly, there may be some impacts from a loss of investment funding from European institutions.” For another, “research funding will be the issue – and university research programmes such as [the EU’s research funding stream] Horizon 2020 become out of reach”. Some said it was possible to see opportunities in training, for example, “to increase the number of British technicians that would provide significant economic benefits for the UK”. We asked what is the minimum domestic requirement to provide credibility and skills if the UK is to play a part in the global wind industry. Top of the list for respondents was the UK’s reputation for having the necessary skills – and the ability to deliver if that reputation were to be maintained. As important was ensuring that global companies serving the industry had a strong UK footprint. The next most important attribute was a domestic onshore wind project pipeline. Perhaps because reputation came out so strongly, the UK’s strong offshore wind programme and the potential for repowering existing sites were less of a positive reference, respondents thought, as was the UK’s expertise in other aspects of the electricity supply industry. New Power, in partnership with market research company Accent, consults the Expert Forum regularly on key industry issues. Many thanks to all those who have joined the group. Comments used will be anonymised, unless members are happy to be identified. ← Take ACER survey: what is the value of electricity? NuScale are off the starting blocks with the NRC in the USA, with their 50 MW Small Modular Reactor [SMR]. 12 units make up a nett 570 MW nuclear power plant [npp]. A single 570 MW Nuscale npp, on the site the size of a large supermarket, can generate ALL of the 24/7 electricity needs of a [UK] population of 870,000 people. Pen-y-Cmoedd Windfarm is the latest UK onshore windfarm to become operational. It has a 228 MW installed capacity with a capital cost £365 million and occupies 47 km2 . Bearing in mind wind turbines degrade at a rate of 1.6% p.a, the average capacity factor [cf] over its 25 year [hoped for] lifespan is 29.4%. A NuScale 570 MW SMR nuclear power plant, costing £2,126 million on a 0.16 km2 site will have a 90% cf for all of its 60 year design life. A bit of simple arithmetic results in over 18 Pen-y-Cmoedd-sized windfarms being needed to generate the same amount of intermittent electricity as NuScale’s npp. That would total £6,704 million of capital cost and would occupy an area almost 30 km x 30 km. Adding in estimates for O & M, fuel and decommissioning costs, the npp’s total would still only be 2/3 of onshore wind at £4,6740 million. And that’s ignoring O & M and decommissioning costs and the real, but unquantifiable, total costs of the ‘intermittency problem’ of renewable on a nation’s or state’s economy. Right now, Claire Perry should be applying her ‘triple test to the Rolls-Royce SMR if she wants a cost-effective, decarbonising, exportable technology to put her and her department’s efforts into – forget about onshore wind.